Apparently, all of the surrounding areas of Burlington do firework shows on the Fourth (Essex, Winoosky, Colchester, etc.). Burlington, being the biggest city in Vermont, doesn’t want to compete with the other cool kids in town when it comes to firework shows. So Burlington has its firework shows on the 3rd, raining in about 10,000 people to watch it, and then on the Fourth everyone can go their separate ways and argue over which show is better while Burlington stays firmly out of the argument. Kind of a cop out Burlington, if you ask me. 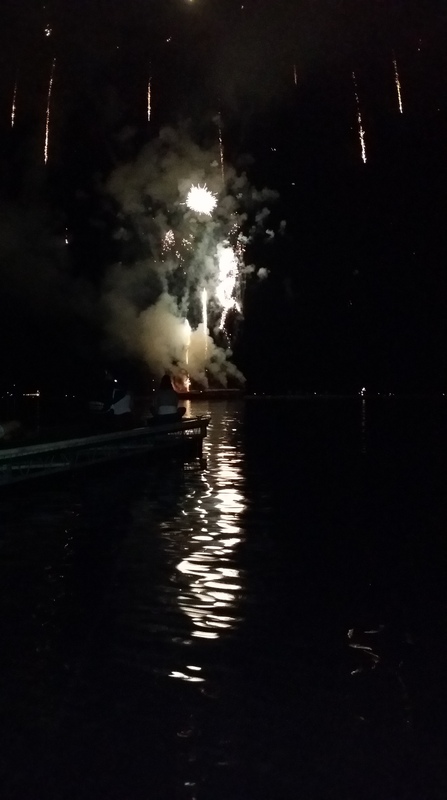 Especially because the weather was horrible on the 3rd, forcing the cancelation of the air show and creating such a huge cloud around every firework that the boat looked like it was on fire or in the middle of warfare, which I guess is a great metaphor on this day, really. So after a night of fireworks, I spent my actual Independence Day feeling wonderfully independent as I moved into my new place. I love it already for its abundance of natural lighting, spacious rooms, and of course the balcony that overlooks Lake Champlain. Needless to say, my Fourth of July didn’t offer much in the way of BBQing and wearing red, white, and blue, but that doesn’t mean we didn’t know how to make it fun with a couple rounds of mimosas.